These looms are very small and simple looms but can be used to produce a surprising number of pattern variations. They are most useful to inexpensively demonstrate the process of weaving although they contain instructions for joining the woven pieces together to make larger finished pieces -- kind of like assembling patchwork quilt squares. A majority of the cloth used during the civil war was produced commercially, a lot being woven in New England (if you want to learn more about the textile industry, you would be well advised to visit the Lowell National Historic Site in Lowell, MA, and the private textile museum that is in the vicinity) or in Europe. However, in the book _Children of Bladensfield_ which is about some children growing up on the Northern Neck in Virginia before and during the civil war, the author mentions that some of their cloth was woven by a woman who lived in the vicinity of their home. These looms, while much smaller than any commercial loom or home-use looms, they can be used to illustrate how weaving was done since the principles are the same. 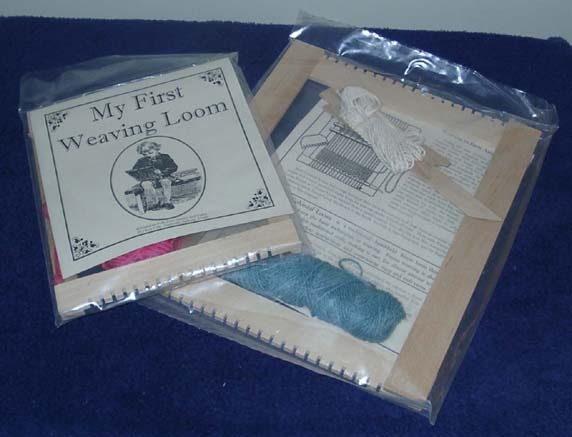 The looms are shown here in their packaging. We'll be working on getting a picture of each one set up so that you can see better what they look like. Tune in to later updates of the page.